The Mosque inside the fort is protected by the A.S.I. It was built in 1750 and constructed of granite stones with mortar, on three sides. At present it is not used for worship and the gates of the mosque are closed. It is rectangular in shape. On the front side it is plastered with lime and bricks. The Hindu architecture slowly yielded place to the flourishing Muslim architecture which is evident in the form of innumerable mosques and palaces which are Indo-Saracenic style. 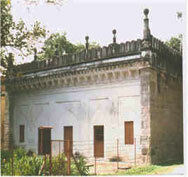 Another important monument of attraction is that of the Mosque of Nawab Chanda Sahib. It was built in 1750 A.D. The entrance of the masjid is on the Northern side. At the top of the structure, provision is made for the speakers. On all the four sides of the structure it is decorated with arch shapes. It is constructed with brick and lime. Pillars are constructed in two lines, inner and outer and each row has four pillars. The outer pillars are smaller in height in comparison with the pillars inside. For performing Namaz, on the Western side a large prayer hall or courtyard of about fifteen feet in breadth and forty feet in length was constructed. On the back to it lies the Mehrab. The devotes has to worship before this Mehrab and on the right hand side to it lies a platform for the Imam to perform the worship. The pillars found in the mosque are about two and a half feet in breadth on the facing side and about a feet in the sides. On the southern end of the mosque there are flight of steps which lead to the upper part of the mosque. At the centre of the mosque there is a big dome and on the sides there are minars. The minors on the northern and southern sides are very big and minors behind the dome is very small. There are floral designs in the smaller pillars.